The best home style family restaurant serving a variety of dishes. A little construction can't stop us! Just turn on Taft off of West st. We are open regular hours! 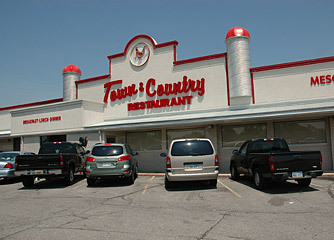 When Town and Country restaurant opened its doors in 1957, it was one of the best family style diners in west Wichita. 48 years later in the same location, they are still considered one of the best home style family restaurants serving a variety of home cooked dishes and diner classics. For breakfast you can enjoy the traditional ham and eggs, biscuits and gravy, corned beef hash, country skillet breakfasts, pancakes piled high and more. Lunch includes all of your favorites at the prices you deserve. Our menu includes hamburgers, fries, sandwiches, salads, desserts and more. For dinner, take the family out for some delicious homestyle food. Great steaks like the famous Prime Rib or T-bone. Plus classics like chicken fried steak, meat loaf, fried chicken, soups, seafood and more. Plus we have a great kids menu. Drop on by for breakfast, lunch or dinner and enjoy some great food at prices that are still old fashioned.